SALEM, MA — The Peabody Essex Museum (PEM) is pleased to announce the appointment of Steven Mallory as its Manager of Historic Structures and Landscapes. PEM’s architecture collection, which preserves 22 noted historic structures — four of which are National Historic Landmarks and six of which are listed on the National Register of Historic Places — is the largest of any American art museum. This new position will ensure that PEM’s architecture collection and its associated grounds are cared for at the highest standard and that the public will be able to experience them in exciting and innovative, new ways. In his capacity as Lead Architectural Conservator and Principal Investigator at Groundroot Preservation Group, LLC, Mallory has spent the last six years working directly with PEM’s architecture collection, providing detailed analysis of more than a dozen of the museum’s historic properties and developing preservation and long term planning recommendations. “Steven brings an unmatched set of theoretical and practical skills to his role at PEM,” says Robert Monk, PEM’s Director of Facilities. In addition to being a noted scholar, lecturer and architectural conservator, Steven is trained in restoration carpentry, fine woodworking and landscaping. Perhaps his greatest asset, however, is his boundless enthusiasm and contagious passion for historic structures. Prior to working at Groundroot Preservation Group, Mallory was the Manager of Preservation at George Washington’s Mount Vernon Estate, Museum and Gardens, where he oversaw restoration and conservation planning efforts, managed a team of contractors and artisans, and undertook hands-on restoration and conservation projects. In addition, he helped lead public outreach, donor cultivation and ambassadorship efforts. Mallory has a MS in Historic Preservation with a concentration in Architectural Conservation Science from the University of Vermont and a BS in Architectural History with a concentration in American Architecture from Skidmore College. 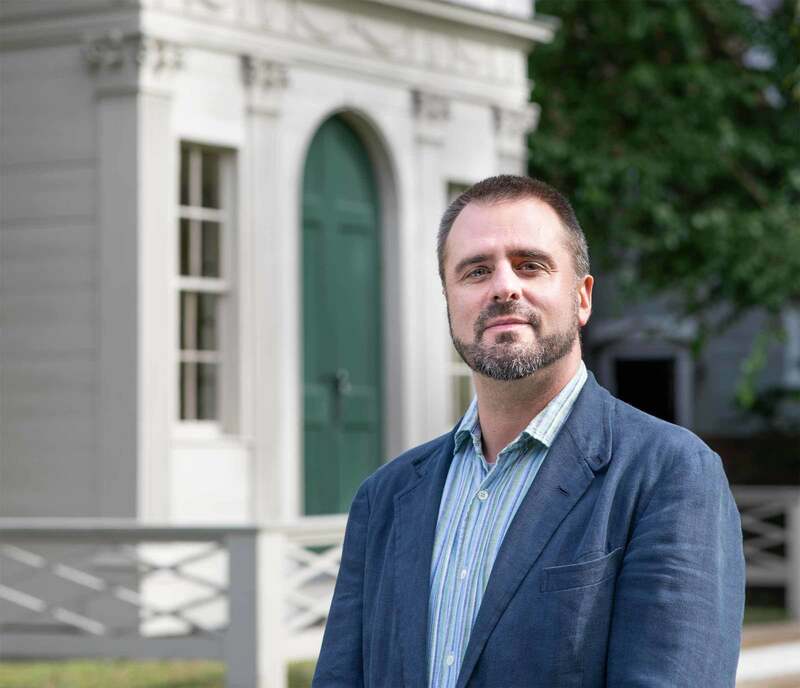 Steven Mallory in front of PEM’s Derby-Beebe Summer House (Photo by Bob Packert / Courtesy Peabody Essex Museum). A pioneer in historic preservation dating to the 1860s, PEM is renowned for the role it has played in illuminating New England's architectural history. Today, PEM preserves 22 historic structures, including Yin Yu Tang, an 18th-century Chinese merchant's house transported from China and reassembled on the museum’s campus. The rich diversity of architectural styles popular in the Salem region during the past 300 years are prevalent, including the finest surviving works by Federal period architect and woodcarver Samuel McIntire. Founded in 1799, PEM is the oldest continuously operating museum in the nation. Over the past twenty five years, PEM has distinguished itself as one of the fastest-growing art museums in America and now ranks among the top ten percent based on size, endowment, and operating budget. PEM creates transformative experiences of art, culture, and creative expression and is dedicated to creating new strategies for engagement, impact, and innovation. The museum’s exhibitions, presented at home and at first-tier art museums worldwide, provide surprising, compelling, and thought-provoking experiences. The museum's collections are among the finest of their kind, boasting superlative works from around the globe and across time -- including Chinese, Japanese, Korean, South Asian, Maritime, Native American, Oceanic, American, American Decorative, Fashion, Photography, and Asian Export Art. Its library collection is one of the nation’s most important museum-based collections of rare books and manuscripts, and PEM’s architecture collection of 22 noted historic structures includes Yin Yu Tang, the only complete antique Chinese house located outside China. PEM's education and public programs serve diverse audiences of all ages and the museum’s campus offers a varied and unique visitor experience with hands-on creativity zones, interactive opportunities, and performance spaces. PEM’s visitor satisfaction ratings are consistently highly ranked and it is the only art museum in the world to employ a full-time neuroscientist to help design more exciting and impactful experiences based on brain research. HOURS: Open Tuesday-Sunday, 10 am-5 pm. Closed Mondays, Thanksgiving, Christmas and New Year's Day. ADMISSION: Adults $20; seniors $18; students $12. Additional admission to Yin Yu Tang: $6 (plus museum admission). Members, youth 16 and under and residents of Salem enjoy free general admission and free admission to Yin Yu Tang. INFO: Call 866-745-1876 or visit pem.org.